Over Top: Grullo Embroidered Crinkle Chiffon. Features alluring and sweet embellishments accentuates on front borders, all over the front and applique work on hemline. Sleeveless. Front open. Lining inside. Edges finished. Under Top: Grullo Crinkle Chiffon Shirt features floral embellishments and embroidery accent all over the front. Square neckline. Concealed zip closure back. Lining inside. Edges finished. Bottom: Dark Taupe Raw Silk Comes with gorgeous lehenga skirt adorned heavy embellishments and embroidery all over and beautiful applique work border on the hem. Fixed waist banned with hooks closure. Edges finished. 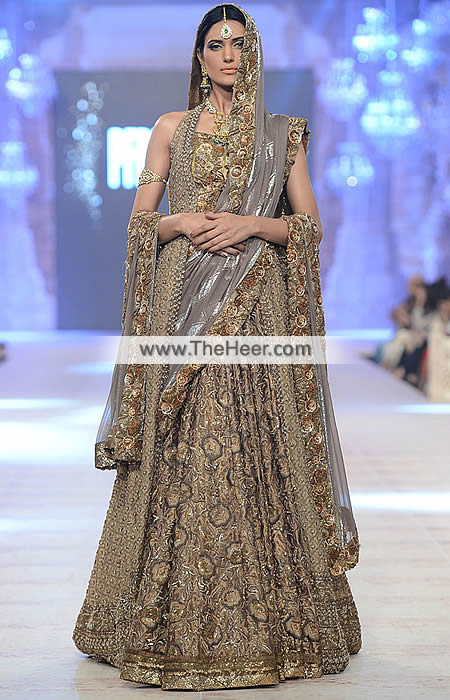 This marvelous dress with heavy lehenga is perfect for reception and Walima. Click the button below to add the BW6082 Grullo Dark Taupe Cinereous Embroidered Crinkle Chiffon Raw Silk Lehenga to your wish list.